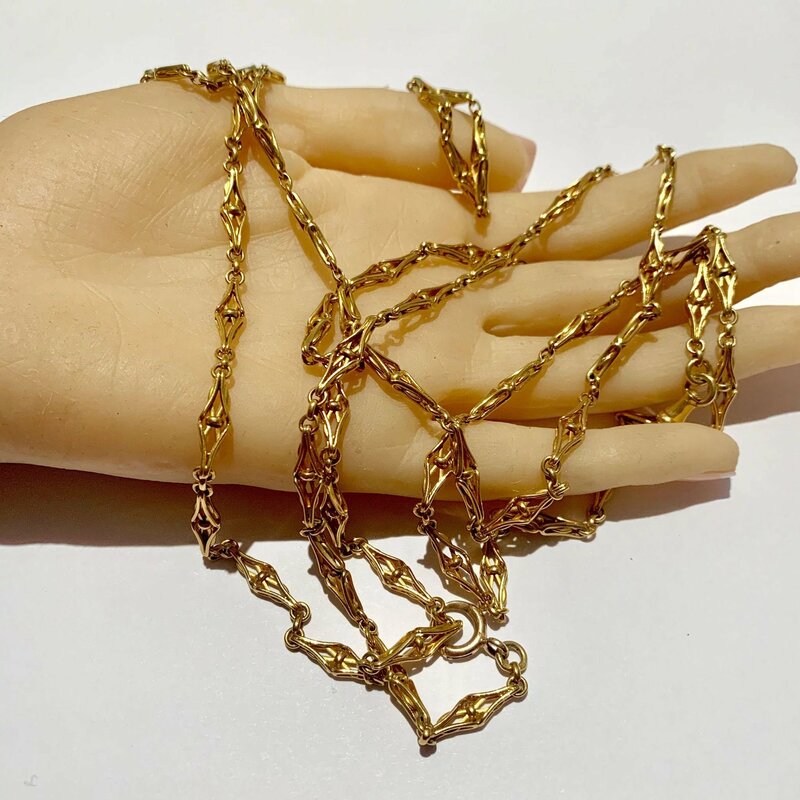 French antique long chains, were the rage at the turn of the 19th century. 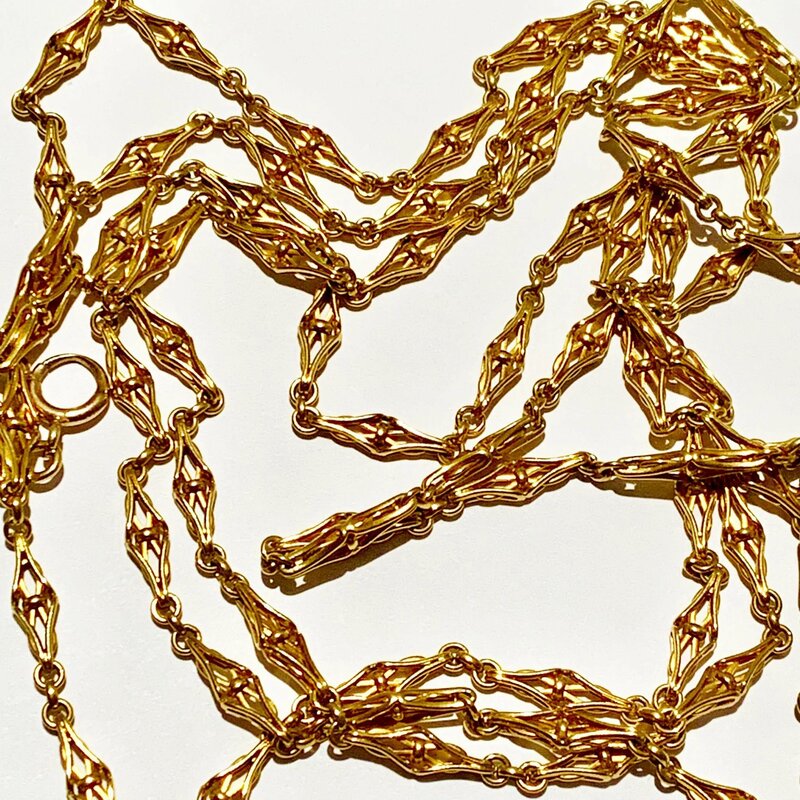 The French chains were among the finest, as the links were hand made and the rich gold patina distinguished them from others made in various countries. The chains were joined by quizzing glasses, fobs , pocket watches and lockets. Worn alone or joined with other jewels, they were as elegant and desirable in 1890, as they are today. However, they have become scarce like all fine jewels. The years have seen these chains divided, destroyed or scrapped for their weight in gold. The latter being the saddest of all. 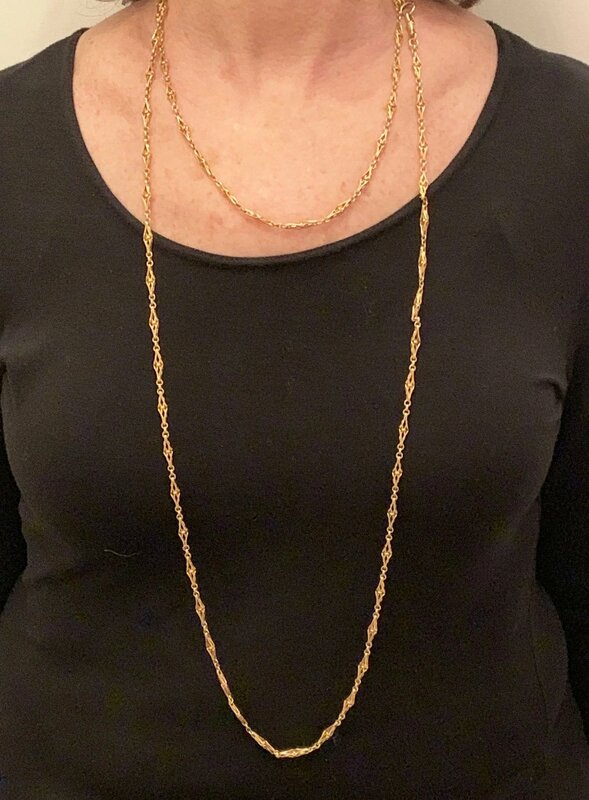 I purchased this particularchain in Paris, several years ago and have had a hard time parting with it, knowing I would most likely never be able to replace it. 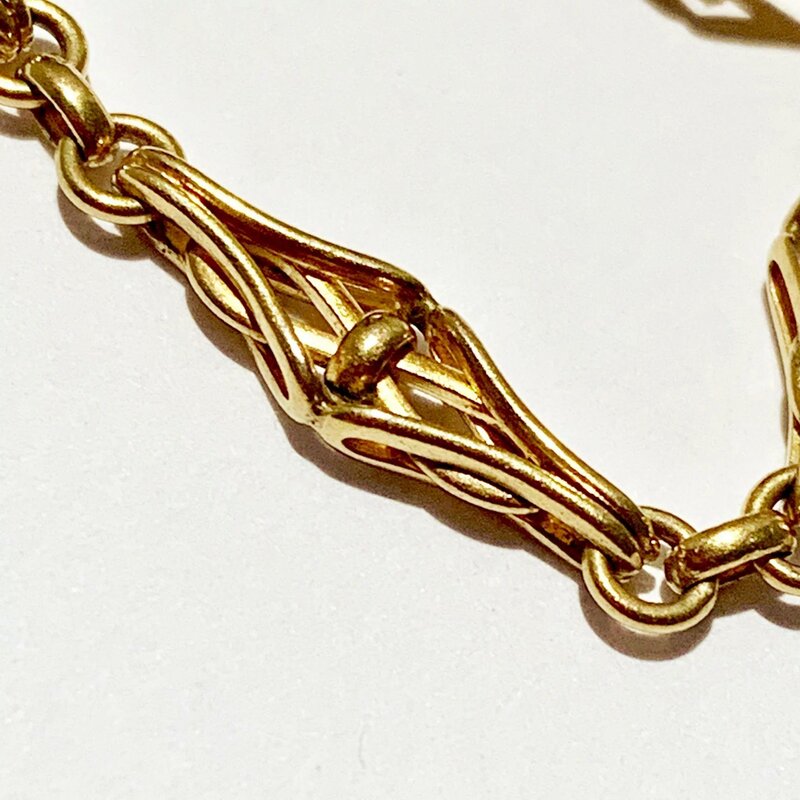 The links are a very intricate lozenge shape, with layers that create dimension. It measures a very long 60 inches X 5 mm wide. The weight is quite substantial, 63 grams which is over 2 ounces of 18 karat gold. 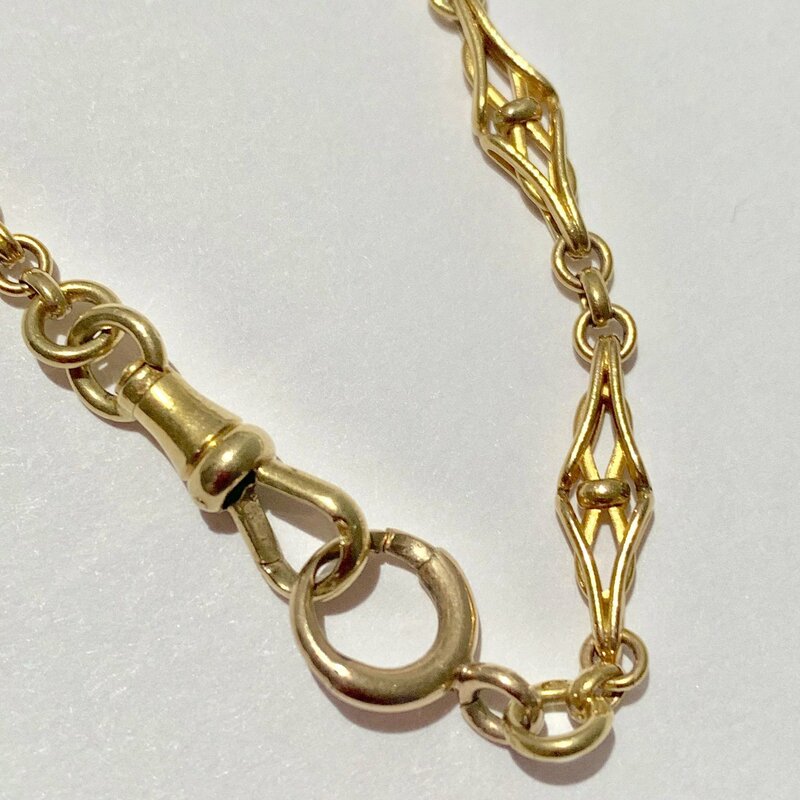 It retains a rich yellow gold patina and French guarantee stamps for 18 karat gold on the end rings and dog clasp. It can be worn a multitude of ways, doubled, tripled, worn alone, or joined with another piece of jewelry. Worn for casual or dress attire, it is unique in its beauty..
Every trip to Paris I search for these, and they have become so rare to find in good condition, with substantial weight and beautiful patina.